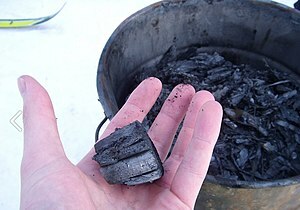 Biochar is charcoal used as a soil amendment. Biochar is a stable solid, rich in carbon, and can endure in soil for thousands of years. Like most charcoal, biochar is made from biomass via pyrolysis. Biochar is under investigation as an approach to carbon sequestration, as it has the potential to help mitigate climate change. It results in processes related to pyrogenic carbon capture and storage (PyCCS). Independently, biochar can increase soil fertility of acidic soils (low pH soils), increase agricultural productivity, and provide protection against some foliar and soil-borne diseases. Regarding the definition from the production part, biochar is defined by the International Biochar Initiative as "The solid material obtained from the thermochemical conversion of biomass in an oxygen-limited environment". Pre-Columbian Amazonians are believed to have used biochar to enhance soil productivity. They seem to have produced it by smoldering agricultural waste (i.e., covering burning biomass with soil) in pits or trenches. European settlers called it terra preta de Indio. Following observations and experiments, a research team working in French Guiana hypothesized that the Amazonian earthworm Pontoscolex corethrurus was the main agent of fine powdering and incorporation of charcoal debris to the mineral soil. Biochar is a high-carbon, fine-grained residue that today is produced through modern pyrolysis processes; it is the direct thermal decomposition of biomass in the absence of oxygen (preventing combustion), which produces a mixture of solids (the biochar proper), liquid (bio-oil), and gas (syngas) products. The specific yield from the pyrolysis is dependent on process condition, such as temperature, residence time and heating rate. These parameters can be optimized to produce either energy or biochar. Temperatures of 400–500 °C (673–773 K) produce more char, while temperatures above 700 °C (973 K) favor the yield of liquid and gas fuel components. Pyrolysis occurs more quickly at the higher temperatures, typically requiring seconds instead of hours. The increasing heating rate will also lead to a decrease of pyrolysis biochar yield, while the temperature is in the range of 350–600 °C (623–873 K). Typical yields are 60% bio-oil, 20% biochar, and 20% syngas. By comparison, slow pyrolysis can produce substantially more char (≈35%); it is this which contributes to the observed soil fertility of terra preta. Once initialized, both processes produce net energy. For typical inputs, the energy required to run a “fast” pyrolyzer is approximately 15% of the energy that it outputs. Modern pyrolysis plants can use the syngas created by the pyrolysis process and output 3–9 times the amount of energy required to run. Besides pyrolysis, torrefaction and hydrothermal carbonization process can also thermally decompose biomass to the solid material. However, these products cannot be strictly defined as biochar. The carbon product from the torrefaction process still remains some volatile organic components, thus its properties are between that of biomass feedstock and biochar. Furthermore, even the hydrothermal carbonization could produce a carbon-rich solid product, the hydrothermal carbonization is evidently different from the conventional thermal conversion process. Therefore, the solid product from hydrothermal carbonization is defined as "hydrochar" rather than "biochar". 2, black carbon, and other greenhouse gases (GHGs) (and potentially, toxins) into the air, though less greenhouse gasses than captured during the growth of the biomass. Commercial-scale systems process agricultural waste, paper byproducts, and even municipal waste and typically eliminate these side effects by capturing and using the liquid and gas products. The production of biochar as an output is not a priority in most cases. In a centralized system, all biomass in a region is brought to a central plant for processing. Alternatively, each farmer or group of farmers can operate a lower-tech kiln. Finally, a truck equipped with a pyrolyzer can move from place to place to pyrolyze biomass. Vehicle power comes from the syngas stream, while the biochar remains on the farm. The biofuel is sent to a refinery or storage site. Factors that influence the choice of system type include the cost of transportation of the liquid and solid byproducts, the amount of material to be processed, and the ability to feed directly into the power grid. For crops that are not exclusively for biochar production, the Residue-to-Product Ratio (RPR) and the collection factor (CF) the percent of the residue not used for other things, measure the approximate amount of feedstock that can be obtained for pyrolysis after harvesting the primary product. For instance, Brazil harvests approximately 460 million tons (MT) of sugarcane annually, with an RPR of 0.30, and a CF of 0.70 for the sugarcane tops, which normally are burned in the field. This translates into approximately 100 MT of residue annually, which could be pyrolyzed to create energy and soil additives. Adding in the bagasse (sugarcane waste) (RPR=0.29 CF=1.0), which is otherwise burned (inefficiently) in boilers, raises the total to 230 MT of pyrolysis feedstock. Some plant residue, however, must remain on the soil to avoid increased costs and emissions from nitrogen fertilizers. Pyrolysis technologies for processing loose and leafy biomass produce both biochar and syngas. Alternatively, "thermo-catalytic depolymerization", which utilizes microwaves, has recently been used to efficiently convert organic matter to biochar on an industrial scale, producing ≈50% char. The physical and chemical properties of biochars decided by feedstocks and technologies are crucial for the application of biochars in the industry and environment. Different characterization data are employed to biochars and determine their performances in a specific use. For example, the guideline published by Internation Biochar Initiative provided standardized methods in evaluating the product quality of biochar for soil application. These properties of biochar can be characterized by various aspects, including the proximate and elemental composition, pH value, porosity etc., which correlate to different biochar properties. The atomic ratios of biochar, including H/C and O/C ratio, correlate the biochar properties that relevant to the soil organic removal such as polarity and aromaticity. The van-Krevelen diagram can be used to show the evolution of biochar atomic ratios in the production process. In the carbonization process, both the H/C and O/C ratio decreased due to the release of functional groups which contain hydrogen and oxygen. 2 to the atmosphere. Biochar is a stable way of storing carbon in the ground for centuries, potentially reducing or stalling the growth in atmospheric greenhouse gas levels; at the same time its presence in the earth can improve water quality, increase soil fertility, raise agricultural productivity, and reduce pressure on old-growth forests. Biochar can sequester carbon in the soil for hundreds to thousands of years, like coal. Such a carbon-negative technology would lead to a net withdrawal of CO2 from the atmosphere, while producing consumable energy. This technique is advocated by prominent scientists such as James Hansen, head of the NASA Goddard Institute for Space Studies, and James Lovelock, creator of the Gaia hypothesis, for mitigation of global warming by greenhouse gas remediation. 2-Ce, without endangering food security, habitat, or soil conservation. Biochar is recognized as offering a number of benefits for soil health. Many benefits are related to the extremely porous nature of biochar. This structure is found to be very effective at retaining both water and water-soluble nutrients. Soil biologist Elaine Ingham indicates the extreme suitability of biochar as a habitat for many beneficial soil micro organisms. She points out that when pre-charged with these beneficial organisms biochar becomes an extremely effective soil amendment promoting good soil, and in turn plant, health. Switching from slash-and-burn to slash-and-char farming techniques in Brazil can decrease both deforestation of the Amazon basin and carbon dioxide emission, as well as increase crop yields. Slash-and-burn leaves only 3% of the carbon from the organic material in the soil. Slash-and-char can keep up to 50% of the carbon in a highly stable form. Returning the biochar into the soil rather than removing it all for energy production reduces the need for nitrogen fertilizers, thereby reducing cost and emissions from fertilizer production and transport. Additionally, by improving the soil's ability to be tilled, fertility, and productivity, biochar–enhanced soils can indefinitely sustain agricultural production, whereas non-enriched soils quickly become depleted of nutrients, forcing farmers to abandon the fields, producing a continuous slash and burn cycle and the continued loss of tropical rainforest. Using pyrolysis to produce bio-energy also has the added benefit of not requiring infrastructure changes the way processing biomass for cellulosic ethanol does. Additionally, the biochar produced can be applied by the currently used machinery for tilling the soil or equipment used to apply fertilizer. Biochar is hygroscopic. Thus it is a desirable soil material in many locations due to its ability to attract and retain water. This is possible because of its porous structure and high surface area. As a result, nutrients, phosphorus, and agrochemicals are retained for the plants benefit. Plants are therefore healthier, and less fertilizer leaches into surface or groundwater. Mobile pyrolysis units can be used to lower the costs of transportation of the biomass if the biochar is returned to the soil and the syngas stream is used to power the process. Bio-oil contains organic acids that are corrosive to steel containers, has a high water vapor content that is detrimental to ignition, and, unless carefully cleaned, contains some biochar particles which can block injectors. Currently, it is less suitable for use as a kind of biodiesel than other sources. If biochar is used for the production of energy rather than as a soil amendment, it can be directly substituted for any application that uses coal. Pyrolysis also may be the most cost-effective way of electricity generation from biomaterial. The pyrolysis of forest- or agriculture-derived biomass residue generates a biofuel without competition with crop production. Biochar is a pyrolysis byproduct that may be ploughed into soils in crop fields to enhance their fertility and stability, and for medium- to long-term carbon sequestration in these soils. It has meant a remarkable improvement in tropical soils showing positive effects in increasing soil fertility and in improving disease resistance in West European Soils. 2, especially through plant production, but only a small portion is stably sequestered for a relatively long time (soil, wood, etc.). 2 is removed from the atmosphere than released, thus enabling long-term sequestration. Intensive research into manifold aspects involving the pyrolysis/biochar platform is underway around the world. From 2005 to 2012, there were 1,038 articles that included the word “biochar” or “bio-char” in the topic that had been indexed in the ISI Web of Science. Further research is in progress by such diverse institutions around the world as Cornell University, the University of Edinburgh (which has a dedicated research unit), University of Georgia the Agricultural Research Organization (ARO) of Israel, Volcani Center, where a network of researchers involved in biochar research (iBRN, Israel Biochar Researchers Network) was established as early as 2009, and the University of Delaware. Long-term effect of biochar on soil C sequestration of recent carbon inputs has been examined using soil from arable fields in Belgium with charcoal-enriched black spots dating >150 years ago from historical charcoal production mound kilns. Topsoils from these ‘black spots’ had a higher organic C concentration [3.6 ± 0.9% organic carbon (OC)] than adjacent soils outside these black spots (2.1 ± 0.2% OC). The soils had been cropped with maize for at least 12 years which provided a continuous input of C with a C isotope signature (δ13C) −13.1, distinct from the δ13C of soil organic carbon (−27.4 ‰) and charcoal (−25.7 ‰) collected in the surrounding area. The isotope signatures in the soil revealed that maize-derived C concentration was significantly higher in charcoal-amended samples (‘black spots’) than in adjacent unamended ones (0.44% vs. 0.31%; P = 0.02). Topsoils were subsequently collected as a gradient across two ‘black spots’ along with corresponding adjacent soils outside these black spots and soil respiration, and physical soil fractionation was conducted. Total soil respiration (130 days) was unaffected by charcoal, but the maize-derived C respiration per unit maize-derived OC in soil significantly decreased about half (P < 0.02) with increasing charcoal-derived C in soil. Maize-derived C was proportionally present more in protected soil aggregates in the presence of charcoal. The lower specific mineralization and increased C sequestration of recent C with charcoal are attributed to a combination of physical protection, C saturation of microbial communities and, potentially, slightly higher annual primary production. Overall, this study provides evidence of the capacity of biochar to enhance C sequestration in soils through reduced C turnover on the long term. (Hernandez-Soriano et al, 2015). Students at Stevens Institute of Technology in New Jersey are developing supercapacitors that use electrodes made of biochar. A process developed by University of Florida researchers that removes phosphate from water, also yields methane gas usable as fuel and phosphate-laden carbon suitable for enriching soil. Researchers at The University of Auckland also working on utilizing biochar in concrete applications to reduce carbon emissions during concrete production and to improve the strength considerably. It has also demonstrated that the biochar can be used as a suitable filler in polymer matrix. Current biochar projects make no significant impact on the overall global carbon budget, although expansion of this technique has been advocated as a geoengineering approach. In May 2009, the Biochar Fund, a small "social profit organization", received a grant from the Congo Basin Forest Fund for a project in Central Africa to simultaneously slow down deforestation, increase the food security of rural communities, provide renewable energy and sequester carbon. Though some farmers did report better maize crops, the project ended early without significant results and with promises to the farmers not kept. Application rates of 2.5–20 tonnes per hectare (1.0–8.1 t/acre) appear to be required to produce significant improvements in plant yields. Biochar costs in developed countries vary from $300–7000/tonne, generally too high for the farmer/horticulturalist and prohibitive for low-input field crops. In developing countries, constraints on agricultural biochar relate more to biomass availability and production time. An alternative is to use small amounts of biochar in lower cost biochar-fertilizer complexes. Various companies in North America, Australia, and England sell biochar or biochar production units. In Sweden the 'Stockholm Solution' is an urban tree planting system that uses 30% biochar to support healthy growth of the urban forest. The Qatar Aspire Park now uses biochar to help trees cope with the intense heat of their summers. At the 2009 International Biochar Conference, a mobile pyrolysis unit with a specified intake of 1,000 pounds (450 kg) was introduced for agricultural applications. The unit had a length of 12 feet and height of 7 feet (3.6 m by 2.1m). A production unit in Dunlap, Tennessee by Mantria Corporation opened in August 2009 after testing and an initial run, was later shut down as part of a Ponzi scheme investigation. ^ a b Lean, Geoffrey (7 December 2008). "Ancient skills 'could reverse global warming'". The Independent. Archived from the original on 13 September 2011. Retrieved 1 October 2011. ^ "Geoengineering the climate: science, governance and uncertainty". The Royal Society. 2009. Retrieved 22 August 2010. ^ Dominic Woolf; James E. Amonette; F. Alayne Street-Perrott; Johannes Lehmann; Stephen Joseph (August 2010). "Sustainable biochar to mitigate global climate change". Nature Communications. 1 (5): 56. Bibcode:2010NatCo...1E..56W. doi:10.1038/ncomms1053. ISSN 2041-1723. PMC 2964457. PMID 20975722. ^ "Slash and Char". Retrieved 19 September 2014. ^ "Standardized production definition and product testing guidelines for biochar that is used in soil" (PDF). 2015. Retrieved 23 November 2015. ^ a b c Lehmann 2007a, pp. 381–387 Similar soils are found, more scarcely, elsewhere in the world. To date, scientists have been unable to completely reproduce the beneficial growth properties of terra preta. It is hypothesized that part of the alleged benefits of terra preta require the biochar to be aged so that it increases the cation exchange capacity of the soil, among other possible effects. In fact, there is no evidence natives made biochar for soil treatment, but rather for transportable fuel charcoal; there is little evidence for any hypothesis accounting for the frequency and location of terra preta patches in Amazonia. Abandoned or forgotten charcoal pits left for centuries were eventually reclaimed by the forest. In that time, the initially harsh negative effects of the char (high pH, extreme ash content, salinity) wore off and turned positive as the forest soil ecosystem saturated the charcoals with nutrients. supra note 2 at 386 ("Only aged biochar shows high cation retention, as in Amazonian Dark Earths. At high temperatures (30–70°C), cation retention occurs within a few months. The production method that would attain high CEC in soil in cold climates is not currently known.") (internal citations omitted). ^ Jean-François Ponge; Stéphanie Topoliantz; Sylvain Ballof; Jean-Pierre Rossi; Patrick Lavelle; Jean-Marie Betsch; Philippe Gaucher (2006). "Ingestion of charcoal by the Amazonian earthworm Pontoscolex corethrurus: a potential for tropical soil fertility" (PDF). Soil Biology and Biochemistry. 38 (7): 2008–2009. doi:10.1016/j.soilbio.2005.12.024. ^ Tripathi, Manoj; Sabu, J.N. ; Ganesan, P. (21 November 2015). "Effect of process parameters on production of biochar from biomass waste through pyrolysis: A review". Renewable and Sustainable Energy Reviews. 55: 467–481. doi:10.1016/j.rser.2015.10.122. ISSN 1364-0321. ^ a b Winsley, Peter (2007). "Biochar and bioenergy production for climate change mitigation". New Zealand Science Review. 64. (See Table 1 for differences in output for Fast, Intermediate, Slow, and Gasification). ^ Aysu, Tevfik; Küçük, M. Maşuk (16 December 2013). "Biomass pyrolysis in a fixed-bed reactor: Effects of pyrolysis parameters on product yields and characterization of products". Energy. 64 (1): 1002–1025. doi:10.1016/j.energy.2013.11.053. ISSN 0360-5442. ^ Laird 2008, pp. 100, 178–181 "The energy required to operate a fast pyrolyzer is ∼15% of the total energy that can be derived from the dry biomass. Modern systems are designed to use the syngas generated by the pyrolyzer to provide all the energy needs of the pyrolyzer." ^ Kambo, Harpreet Singh; Dutta, Animesh (14 February 2015). "A comparative review of biochar and hydrochar in terms of production, physicochemical properties and applications". Renewable and Sustainable Energy Reviews. 45: 359–378. doi:10.1016/j.rser.2015.01.050. ISSN 1364-0321. ^ Lee, Jechan; Sarmah, Ajit K.; Kwon, Eilhann E. (2019). Biochar from biomass and waste - Fundamentals and applications. Elsevier. pp. 1–462. doi:10.1016/C2016-0-01974-5. ISBN 978-0-12-811729-3. ^ "Production Quantity Of Sugar Cane In Brazil In 2006". FAOSTAT. 2006. Archived from the original on 6 September 2015. Retrieved 1 July 2008. ^ Perera, K.K.C.K., P.G. Rathnasiri, S.A.S. Senarath, A.G.T. Sugathapala, S.C. Bhattacharya, and P. Abdul Salam, Assessment of the sustainable energy potential of non-plantation biomass resources in Sri Lanka, 29 Biomass & Bioenergy 199, 204 (2005) (showing RPRs for numerous plants, describing method for determining available agricultural waste for energy and char production). ^ Laird 2008, pp. 179 "Much of the current scientific debate on the harvesting of biomass for bioenergy is focused on how much can be harvested without doing too much damage." ^ Jorapur, Rajeev; Rajvanshi, Anil K. (1997). "Sugarcane leaf-bagasse gasifier for industrial heating applications". Biomass and Bioenergy. 13 (3): 141–146. doi:10.1016/S0961-9534(97)00014-7. ^ Karagöz, Selhan; Bhaskar, Thallada; Muto, Akinori; Sakata, Yusaku; Oshiki, Toshiyuki; Kishimoto, Tamiya (1 April 2005). "Low-temperature catalytic hydrothermal treatment of wood biomass: analysis of liquid products". Chemical Engineering Journal. 108 (1–2): 127–137. doi:10.1016/j.cej.2005.01.007. ISSN 1385-8947. ^ Jha, Alok (13 March 2009). "'Biochar' goes industrial with giant microwaves to lock carbon in charcoal". The Guardian. Retrieved 23 September 2011. ^ Crombie, Kyle; Mašek, Ondřej; Sohi, Saran P.; Brownsort, Peter; Cross, Andrew (21 December 2012). "The effect of pyrolysis conditions on biochar stability as determined by three methods". Global Change Biology Bioenergy. 5 (2): 122–131. doi:10.1111/gcbb.12030. ISSN 1757-1707. ^ Krevelen D., van (1950). "Graphical-statistical method for the study of structure and reaction processes of coal". Fuel. 29: 269–284. ^ Weber, Kathrin; Quicker, Peter (1 April 2018). "Properties of biochar". Fuel. 217: 240–261. doi:10.1016/j.fuel.2017.12.054. ISSN 0016-2361. ^ Lehmann, Johannes. "Terra Preta de Indio". Soil Biochemistry (internal Citations Omitted). Not only do biochar-enriched soils contain more carbon - 150gC/kg compared to 20-30gC/kg in surrounding soils - but biochar-enriched soils are, on average, more than twice as deep as surrounding soils. ^ Lehmann 2007b "this sequestration can be taken a step further by heating the plant biomass without oxygen (a process known as low-temperature pyrolysis)." ^ Lehmann 2007a, pp. 381, 385 "pyrolysis produces 3–9 times more energy than is invested in generating the energy. At the same time, about half of the carbon can be sequestered in soil. The total carbon stored in these soils can be one order of magnitude higher than adjacent soils. ^ Winsley, Peter (2007). "Biochar and Bioenergy Production for Climate Change Mitigation" (PDF). New Zealand Science Review. 64 (5): 5. ^ Kern, Dirse C. (9–15 July 2006). "New Dark Earth Experiment in the Tailandia City – Para-Brazil: The Dream of Wim Sombroek". 18th World Congress of Soil Science. ^ Hamilton, Tyler (22 June 2009). "Sole option is to adapt, climate author says". The Star. Toronto. ^ Woolf, Dominic; Amonette, James E.; Street-Perrott, F. Alayne; Lehmann, Johannes; Joseph, Stephen (2010). "Sustainable biochar to mitigate global climate change". Nature Communications. 1 (5): 1–9. doi:10.1038/ncomms1053. PMC 2964457. PMID 20975722. ^ Bolster, C.H. ; Abit, S.M. (2012). "Biochar pyrolyzed at two temperatures affects Escherichia coli transport through a sandy soil". Journal of Environmental Quality. 41 (1): 124–133. doi:10.2134/jeq2011.0207. PMID 22218181. ^ Abit, S.M. ; Bolster, C.H. ; Cai, P.; Walker, S.L. (2012). "Influence of feedstock and pyrolysis temperature of biochar amendments on transport of Escherichia coli in saturated and unsaturated soil". Environmental Science and Technology. 46 (15): 8097–8105. Bibcode:2012EnST...46.8097A. doi:10.1021/es300797z. PMID 22738035. ^ Abit, S.M. ; Bolster, C.H. ; Cantrell, K.B. ; Flores, J.Q. ; Walker, S.L. (2014). "Transport of Escherichia coli, Salmonella typhimurium, and microspheres in biochar-amended soils with different textures". Journal of Environmental Quality. 43 (1): 371–378. doi:10.2134/jeq2013.06.0236. PMID 25602571. ^ Elad, Y.; Rav David, D.; Meller Harel, Y.; Borenshtein, M.; Kalifa Hananel, B.; Silber, A.; Graber, E.R. (2010). "Induction of systemic resistance in plants by biochar, a soil-applied carbon sequestering agent". Phytopathology. 100 (9): 913–921. doi:10.1094/phyto-100-9-0913. PMID 20701489. ^ a b Jaiswal, A.K. ; Elad, Y.; Graber, E.R. ; Frenkel, O. (2014). "Rhizoctonia solani suppression and plant growth promotion in cucumber as affected by biochar pyrolysis temperature, feedstock and concentration". Soil Biology and Biochemistry. 69: 110–118. doi:10.1016/j.soilbio.2013.10.051. ^ Silber, A.; Levkovitch, I.; Graber, E. R. (2010). "pH-dependent mineral release and surface properties of cornstraw biochar: Agronomic implications". Environmental Science & Technology. 44 (24): 9318–9323. Bibcode:2010EnST...44.9318S. doi:10.1021/es101283d. PMID 21090742. ^ Glaser, Lehmann & Zech 2002, pp. 224 note 7 "Three main factors influence the properties of charcoal: (1) the type of organic matter used for charring, (2) the charring environment (e.g. temperature, air), and (3) additions during the charring process. The source of charcoal material strongly influences the direct effects of charcoal amendments on nutrient contents and availability." ^ Dr. Wardle points out that improved plant growth has been observed in tropical (depleted) soils by referencing Lehmann, but that in the boreal (high native soil organic matter content) forest this experiment was run in, it accelerated the native soil organic matter loss. Wardle, supra note 18. ("Although several studies have recognized the potential of black C for enhancing ecosystem carbon sequestration, our results show that these effects can be partially offset by its capacity to stimulate loss of native soil C, at least for boreal forests.") (internal citations omitted) (emphasis added). ^ "Biochar decreased N2O emissions from soils. [Social Impact]. FERTIPLUS. Reducing mineral fertilisers and agro-chemicals by recycling treated organic waste as compost and biochar products (2011-2015). Framework Programme 7 (FP7)". SIOR, Social Impact Open Repository. ^ Lehmann 2007a, pp. note 3 at 384 "In greenhouse experiments, NOx emissions were reduced by 80% and methane emissions were completely suppressed with biochar additions of 20 g kg-1 (2%) to a forage grass stand." ^ "Biochar fact sheet". www.csiro.au. Retrieved 2 September 2016. ^ a b "Improvement of soil quality. [Social Impact]. FERTIPLUS. Reducing mineral fertilisers and agro-chemicals by recycling treated organic waste as compost and biochar products (2011-2015). Framework Programme 7 (FP7)". SIOR. Social Impact Open Repository. ^ Julie, Major, Johannes Lehmann, Macro Rondon, and Susan J. Riha. Nutrient Leaching below the Rooting Zone Is Reduced by Biochar, the Hydrology of a Columbian Savanna Oxisol Is Unaffected. Proc. of North American Biochar Conference 2009, University of Colorado at Boulder. Ithaca: Cornell University Department of Crop and Soil Sciences, 2009. Print. ^ Elmer, Wade, Jason C. White, and Joseph J. Pignatello. Impact of Biochar Addition to Soil on the Bioavailability of Chemicals Important in Agriculture. Rep. New Haven: University of Connecticut, 2009. Print. ^ Glaser, Lehmann & Zech 2002, pp. note 7 at 225 "The published data average at about 3% charcoal formation of the original biomass C."
^ Lehmann 2007b, pp. note 9 at 143 "It can be mixed with manures or fertilizers and included in no-tillage methods, without the need for additional equipment." ^ Michael Jacobson, Cedric Briens and Franco Berruti, "Lift tube technology for increasing heat transfer in an annular pyrolysis reactor", CFB’9, Hamburg, Germany, 13–16 May 2008. ^ Yaman, Serdar, pyrolysis of biomass to produce fuels and chemical feedstocks, 45 Energy Conversion & MGMT 651, 659 (2003). ^ Cornet A., Escadafal R., 2009. Is biochar "green"? CSFD Viewpoint. Montpellier, France. 8 pp. ^ Verheijen, F.G.A. ; Graber, E.R. ; Ameloot, N.; Bastos, A.C.; Sohi, S.; Knicker, H. (2014). "Biochars in soils: new insights and emerging research needs". Eur. J. Soil Science. 65: 22–27. doi:10.1111/ejss.12127. hdl:10261/93245. ^ "Can Biochar save the planet?". CNN. Retrieved 10 March 2009. ^ "A Cheaper, Greener Material for Supercapacitors". Stevens Institute of Technology. 2011. Retrieved 25 May 2011. ^ "Biochar" More Effective, Cheaper at Removing Phosphate from Water". University of Florida. 2011. Retrieved 18 May 2011. ^ Akhtar, A., & Sarmah, A. K. (2018). Strength improvement of recycled aggregate concrete through silicon rich char derived from organic waste. Journal of Cleaner Production, 196, 411–423. ^ Anesh Manjaly Poulose,Ahmed Yagoub Elnour, Arfat Anis, Hamid Shaikh, S.M.Al-Zahrani, Justin George, Mohammad I.Al-Wabel, Adel R.Usman, Yong Sik Ok, Daniel C.W.Tsang, Ajit K.Sarmah (2018).Date palm biochar-polymer composites: An investigation of electrical, mechanical, thermal and rheological characteristics.Science of the Total Environment,Volumes 619–620, 1 April 2018, Pages 311-318. ^ a b Lehmann 2007b, pp. 143, 144. ^ Benoit Anthony Ndameu (November 2011). "Biochar Fund Trials in Cameroon: Hype and Unfulfilled Promises" (PDF). Biofuelwatch. Retrieved 19 October 2012. ^ "Soils booster for your garden by Biochar - Naturagain". BioChar.us. Retrieved 25 January 2018. ^ "Soils booster for your garden by Biochar - Naturagain". BioChar.co.uk. Retrieved 25 January 2018. ^ O'Sullivan, Feargus (20 December 2016). "Stockholm's Ingenious Plan to Recycle Yard Waste". Citylab. Retrieved 15 March 2018. ^ Austin, Anna (October 2009). "A New Climate Change Mitigation Tool". Biomass Magazine. BBI International. Retrieved 30 October 2009. ^ Blumenthal, Jeff (17 November 2009). "Wragg, Knorr ordered to halt Mantria operations". Philadelphia Business Journal. Aysu, Tevfik; Küçük, M. Maşuk (16 December 2013). "Biomass pyrolysis in a fixed-bed reactor: Effects of pyrolysis parameters on product yields and characterization of products". Energy. 64 (1): 1002–1025. doi:10.1016/j.energy.2013.11.053. ISSN 0360-5442. Badger, Phillip C.; Fransham, Peter (2006). "Use of mobile fast pyrolysis plants to densify biomass and reduce biomass handling costs—A preliminary assessment". Biomass & Bioenergy. 30 (4): 321–325. doi:10.1016/j.biombioe.2005.07.011. Biederman, Lori A.; W. Stanley Harpole (2011). "Biochar and Managed Perennial Ecosystems". Iowa State Research Farm Progress Reports. Retrieved 12 February 2013. Brewer, Catherine (2012). Biochar Characterization and Engineering (dissertation). Iowa State University. Retrieved 12 February 2013. Crombie, Kyle; Mašek, Ondřej; Sohi, Saran P.; Brownsort, Peter; Cross, Andrew (21 December 2012). "The effect of pyrolysis conditions on biochar stability as determined by three methods". Global Change Biology Bioenergy. 5 (2): 122–131. doi:10.1111/gcbb.12030. ISSN 1757-1707. Gaunt, John L.; Lehmann, Johannes (2008). "Energy Balance and Emissions Associated with Biochar Sequestration and pyrolysis Bioenergy Production". Environmental Sciences & Technologies. 42 (11): 4152–4158. Bibcode:2008EnST...42.4152G. doi:10.1021/es071361i. Glaser, Bruno; Lehmann, Johannes; Zech, Wolfgang (2002). "Ameliorating physical and chemical properties of highly weathered soils in the tropics with charcoal – a review". Biology and Fertility of Soils. 35 (4): 219–230. doi:10.1007/s00374-002-0466-4. Kambo, Harpreet Singh; Dutta, Animesh (14 February 2015). "A comparative review of biochar and hydrochar in terms of production, physico-chemical properties and applications". Renewable and Sustainable Energy Reviews. 45: 359–378. doi:10.1016/j.rser.2015.01.050. ISSN 1364-0321. Laird, David A. (2008). "The Charcoal Vision: A Win–Win–Win Scenario for Simultaneously Producing Bioenergy, Permanently Sequestering Carbon, while Improving Soil and Water Quality". Journal of Agronomy. 100: 178. doi:10.2134/agronj2007.0161. Archived from the original on 15 May 2008. Lee, Jechan; Sarmah, Ajit K.; Kwon, Eilhann E. (2019). Biochar from biomass and waste - Fundamentals and applications. Elsevier. pp. 1–462. doi:10.1016/C2016-0-01974-5. ISBN 978-0-12-811729-3. Lehmann, Johannes (2007a). "Bio-energy in the black" (PDF). Front Ecol Environ. 5 (7). Retrieved 1 October 2011. Lehmann, Johannes (2007b). "A handful of carbon". Nature. 447 (7141): 143–144. Bibcode:2007Natur.447..143L. doi:10.1038/447143a. PMID 17495905. Retrieved 11 January 2008. Lehmann, J.; Gaunt, John; Rondon, Marco; et al. (2006). "Bio-char Sequestration in Terrestrial Ecosystems – A Review" (PDF). Mitigation and Adaptation Strategies for Global Change. 11 (2): 395–427. CiteSeerX 10.1.1.183.1147. doi:10.1007/s11027-005-9006-5. Archived from the original (PDF) on 22 July 2008. Vince, Gaia (3 January 2009). "One last chance to save mankind" (2692). New Scientist. Woolf, Dominic; Amonette, James E.; Street-Perrott, F. Alayne; Lehmann, Johannes; Joseph, Stephen (2010). "Sustainable biochar to mitigate global climate change" (PDF). Nature Communications. 1 (5): 1–9. Bibcode:2010NatCo...1E..56W. doi:10.1038/ncomms1053. PMC 2964457. PMID 20975722. Ameloot, N.; Graber, E.R. ; Verheijen, F.; De Neve, S. (2013). "Effect of soil organisms on biochar stability in soil: Review and research needs". Eur. J. Soil Science. 64 (4): 379–390. doi:10.1111/ejss.12064. Jeffery, S.; Verheijen, F.G.A. ; van der Velde, M.; Bastos, A.C. (2011). "A quantitative review of the effects of biochar application to soils on crop productivity using meta-analysis". Agriculture, Ecosystems & Environment. 144: 175–187. doi:10.1016/j.agee.2011.08.015. Hernandez-Soriano, M.C. ; Kerre, B.; Goos, P.; Hardy, B.; Dufey, J.; Smolders, E. (2015). "Long-term effect of biochar on the stabilization of recent carbon: soils with historical inputs of charcoal". GCB Bioenergy. 8 (2): 371–381. doi:10.1111/gcbb.12250. Hernandez-Soriano, M.C. ; Kerre, B.; Kopittke, P.; Horemans, B.; Smolders, E. (2016). "Biochar affects carbon composition and stability in soil: a combined spectroscopy-microscopy study". Scientific Reports. 6: 25127. Bibcode:2016NatSR...625127H. doi:10.1038/srep25127. PMC 4844975. PMID 27113269. Kerre, B.; Hernandez-Soriano, M.C. ; Smolders, E. (2016). "Partitioning of carbon sources among functional pools to investigate short-term priming effects of biochar in soil: a 13C study". Science of the Total Environment. 547: 30–38. Bibcode:2016ScTEn.547...30K. doi:10.1016/j.scitotenv.2015.12.107. PMID 26780129. Tripathi, Manoj; Sabu, J.N. ; Ganesan, P. (21 November 2015). "Effect of process parameters on production of biochar from biomass waste through pyrolysis: A review". Renewable and Sustainable Energy Reviews. 55: 467–481. doi:10.1016/j.rser.2015.10.122. ISSN 1364-0321. Weber, Kathrin; Quicker, Peter (1 April 2018). "Properties of biochar". Fuel. 217: 240–261. doi:10.1016/j.fuel.2017.12.054. ISSN 0016-2361.